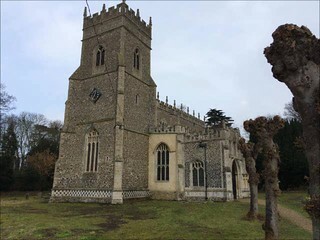 2016: When I first wrote about Hessett fifteen years ago, the entry was by far the biggest on the Suffolk Churches site. There is so much to see inside, that even in those pre-digital days, it became the first entry to make the use of thumbnails for photographs. Since then, I have been back to St Ethelbert several times, including recording several tours of it for BBC Radio Suffolk, but it was not until the February of 2008 that I came back to photograph it digitally, and to take stock of it after the experience of visiting almost every single other medieval church in Norfolk and Suffolk. It was a cold, bright late winter day, and I arrived at about midday, meaning that the glass was particularly difficult to photograph. One of the wall paintings was impossible, because of cast shadows. It was foolish of me not to have realised that this would be the case. However, that is a good excuse to go back soon, and so I shall. In the meantime, I have left the text of what I wrote in 2000 largely unaltered. Until recent years, access to the church was through the priest door in the chancel. Today, you will generally find the main door into the south porch open, but I have left the structure of the narrative as it was when I made those early visits. I have corrected some confusion in the description of the glass, a consequence of my general inability to tell my left from my right. I have also taken the opportunity to go through the text and make myself sound slightly less pompous. One of the delights of Hessett is that there really are genuine mysteries about some of the wall paintings and glass. Digital enhancement has added to these mysteries rather than solving them. In addition, one thing I have learned as I get older, and perhaps a little bit wiser, is that there really are more things in heaven and earth than are dreamed of in our early 21st century philosophy. If this has led to an unravelling of the certainties previously offered, then I can only plead that this is another excuse to go back soon. 2000: Consider for one moment, if you will, the extent to which the beliefs and practices of a religious community affect the architecture of its buildings. Think of a Mosque, for instance. Often square, expressing the democracy of Islam, but without any imagery of the human figure, for such things are proscribed. Think of a Synagogue, focused towards the Holy Scriptures in the Ark, but designed to enable the proclaiming of the Word, and the way that early non-conformist chapels echo this architecture of Judaism - indeed, those who built the first free churches, like Ipswich's Unitarian Chapel, actually called them synagogues. The shape of a church, then, is no accident. 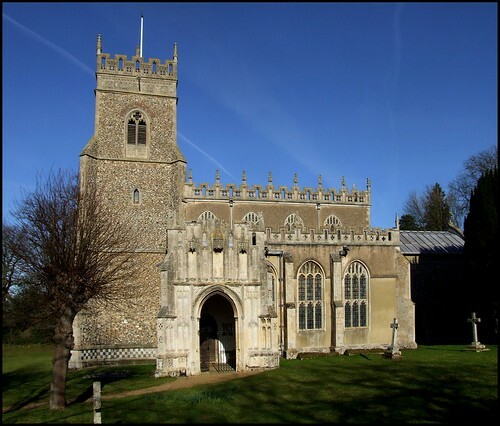 A typical Suffolk perpendicular church of the 15th century has wide aisles, to enable liturgical processions, a chancel for the celebration of Mass, places for other altars, niches for devotional statues, a focus towards the Blessed Sacrament in the east, a roof of angels to proclaim a hymn of praise, a large nave for devotional and social activities, and wall paintings of the Gospels and hagiographies of Saints, of the catechism and teachings of the Catholic Church. As Le Corbusier might have said if he'd been around at the time, a medieval church is a machine for making Catholicism happen. No longer, of course. The radical and violent fracture in popular religion in the middle years of the 16th century gave birth to the Church of England, and the new church inherited buildings that were quite unsuitable for the new congregational protestant theology - a problem that, to some extent, the Church of England has never entirely solved. With the coming to influence of the 19th century Oxford Movement, all this underwent another dramatic change, with the great majority of our medieval parish churches having their interiors restored to their medieval integrity, reinventing themselves as sacramental spaces. This is the condition in which we find most of them today, and some Anglican theologians are asking the question that the Catholic Church asked itself at Vatican II in the 1960s - is a 19th century liturgical space really appropriate for the Church of the 21st century? This may seem like a digression, but I hope it will become apparent why I've raised it. For similar questions have been asked throughout the history of Christianity. So, let us hasten at once to Hessett. Here we are, roughly halfway between Bury and Stowmarket - like nearby Woolpit, this must once have been a more important place than it is today, and perhaps St Ethelbert gives us evidence of that. The church sits like a glowing jewel in its wide churchyard, right on the main road through the village. It is pretty well perfect if you are looking for a fine Suffolk exterior. An extensive 15th century rebuilding enwraps the earlier tower, which was crowned by the donor of the rebuilding, John Bacon.The nave and aisles are deliciously decorated, reminding me rather of neighbouring Rougham, although this is a small church, and the aisles make it almost square. A dedicatory inscription on the two storey vestry in the north east corner bids us pray for the souls of John and Katherine Hoo, who donated the chancel and paid for the trimmings to the aisles. Their inscription has been damaged by protestant reformers, who obviously did not believe in the efficacy of prayers for the dead. Although not comparable with Woolpit, the porch is a grand affair, and a bold statement. You may find the south door locked, but if this is the case then the priest's door into the chancel is usually open. If both are locked, then there is a keyholder, because the people of this parish really want you to see inside this church. And it is as well that they do, for, if you didn't know already, this is one of the most fascinating interiors in the county. In a way, it is rather good to enter it from the chancel, because in this way St Ethelbert unfolds its treasures slowly.You step into relative darkness - or, at least, it seems so in comparison with the nave beyond the rood screen. This is partly a result of the abundance of dark wood, and in truth the chancel appears rather overcrowded. The most striking objects in view are the return stalls, which fill the two westerly corners of the chancel. These are in the style of a college or school of priests, with their backs to the rood screen, but then 'returning' around the walls to the east. They are fine, and are certainly 15th or 16th century. But one of the stalls, that to the north, is different to the others, and seems slightly out of place. It is elaborately carved with faces, birds and foliage. Mortlock thought that it might have been intended for a private house. The stall in front of it has heads on it that appear to be wearing 18th century wigs, although I don't know enough about furniture to be sure if this is the case (or about wigs, for that matter). 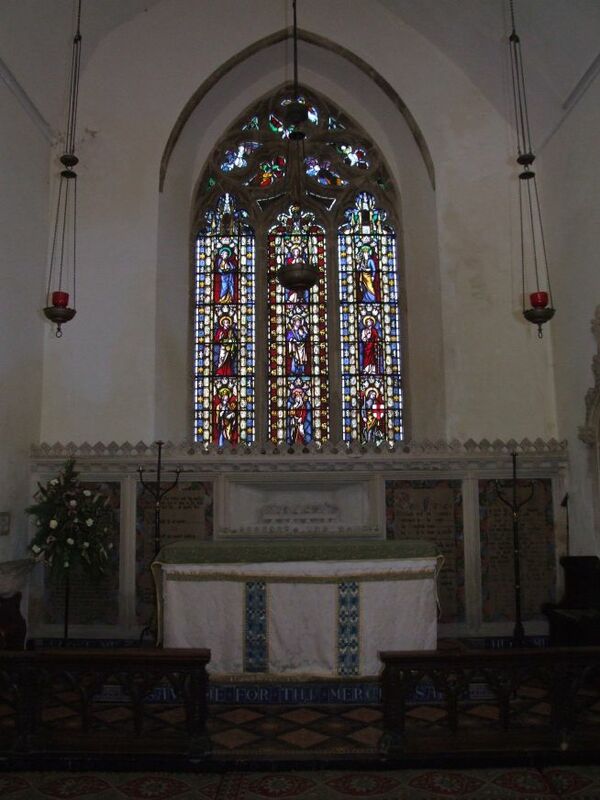 The sanctuary is largely Victorianised, with a great east window depicting Saints. The south windows of the chancel depict a lovely Adoration scene by the O'Connors. The chancel is separated from the nave by the 15th century rood screen, which is elegantly painted and gilt on the west side, the beautifully tracery intricately carved above. The rood screen has been fitted with attractive iron gates, presumably evidence of Anglo-catholic enthusiasm here in the early 20th century, and you step down through them into the light. A first impression is that you are entering a much older space than the one you have left. There is an 18th century mustiness, enhanced by the box pews that line the aisles. And, beyond, on walls and in windows, are wonderful things. The number of surviving wall paintings in England is a tiny fraction of what existed before the 15th and 16th centuries. All churches had them, and in profusion. It isn't enough to say that they were a 'teaching aid' of a church of illiterate peasants. In the main, they were devotional, and that is why they were destroyed. However, it is more complicated than that. Reseach in recent years has indicated that many wall paintings were destroyed before the Reformation, perhaps a century before. In some churches, they have been punched through with Perpendicular windows, which are clearly pre-Reformation. In the decades after the Black Death, there seems to have been a sea change in the liturgical use of these buildings, a move away from an individualistic, devotional usage to a corporate liturgical one. THere is a change of emphasis towards more education and exegesis. This is the time that pulpits and benches appear, long before protestantism was on the agenda. What seems to happen is that many buildings were intended now to be full of light, and devotional wall paintings were either whitewashed, or replaced with cathecetical ones. The decoration of the nave was the responsibility of the people of the parish, not of the Priest. The wall paintings of England can be divided into roughly three groups. Roughly speaking, the development of wall paintings over the later medieval period is in terms of these three overlapping emphases. Firstly, the hagiographies - stories of the Saints. These might have had a local devotion, although some saints were popular over a wide area, and most churches seem to have included a devotion to St Christopher right up until the Reformation. Secondy came those which illustrate incidents in the life of Christ and his mother, the Blessed Virgin. Although partly pedagogical, they were also enabling tools, since private devotions often involved a contemplation upon them, and at Mass the larger part of those present would have been involved in private devotions. Lastly, there are catechetical wall paintings, illustrating the teachings of the Catholic church. It should not be assumed that these are dogmatic - many are simply artistic representations of stories, and others are simplifications of theological ideas - the seven deadly sins and the seven cardinal virtues, for example. Some warn against occasions of sin (gossiping, for example) and generally wall paintings provide a local site for discussion and exemplification. To an extent, all the above is largely true of stained glass, as well, with the caveat that stained glass was more expensive, relied on local patronage, and often has this patronage as a subtext, hence the large number of heraldic devices and images of local worthies. But it was also devotional, and so it was also destroyed. So - what survives at Hessett? The wall paintings first. Starting in the south east corner of the nave, we have Suffolk's finest representation of St Barbara, presenting a tower. St Barbara is a mythical Saint, relegated to non-league status in recent years by the Catholic Church, who nevertheless was very popular in early medieval times, because she was invoked against strikes by lightning and sudden fires. This resulted from her legend; her father, on finding her to be a Christian, walled her up in a tower until she repented. As a result, he was struck by lightning, and reduced to ashes. She was also the patron Saint of the powerful building trade, and as such her image graced their guild altars. Perhaps that was the case here. Above the south door is another figure, often identified as St Christopher, but I do not think that this can be the case. St Christopher is found nowhere else in Suffolk above a south door. The traditional iconography of this mythical Saint is not in place here, and it is hard to see how this figure could ever have been interpreted as such. I suspect it is a result of an early account confusing the two images over the north and south doors, and the mistake being repeated in later accounts. In fact, digital enhancement seems to suggest that there are two figures above the south door, overlapping each other slightly. The figure on the left appears to be winged, while the figure on the right is barefoot, and may be carrying a beam or scales. The Archangel St Michael is often shown weighing souls in doom paintings, but I do not think this is part of a doom (again, it would be exceptional for this to appear over a south door) and I do not think it is St Michael. I think that the figure on the left is probably Gabriel, and this is part of a later Annunciation painting overlapping an earlier image, the barefoot man. So who is he? Another suggestion is that it is St John the Baptist, as he is often shown barefoot. But what if the beam of the 'weighing scales' is actually part of a yoke? The supporting beam appears to continue over the figure's right shoulder, but the left side of his body is lost to us. Could it be that it is not a Saint at all, but some representation of an agricultural worker? Perhaps it is part of a larger image (and we should not forget that the surviving paintings are a small part of what must have been there before). Perhaps it is even part of a hagiography - think of the wheel of the bullock cart in the St Edmund sequence at Thornham Parva, interpreted for many years as St Catherine's wheel. 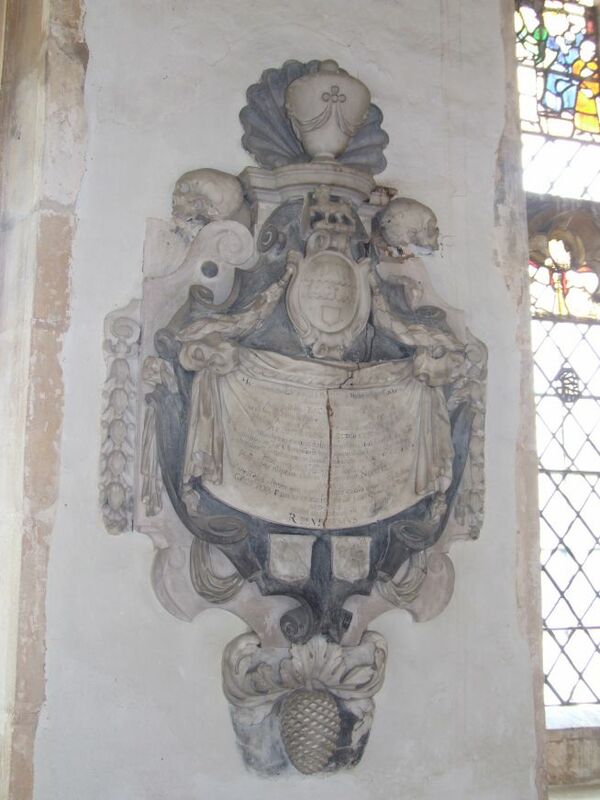 However, I wonder if it might even be a lost image of that most circumscribed of East Anglian Saints, Walstan. He is carrying a scythe on the wall a few miles off at Cavenham - could this be him here? Whatever, it is likely to be part of a hagiographical sequence which was later replaced by a Life of Christ sequence, which usually ran from west to east along the south wall. This would also explain the location of what might be part of an Annunciation scene. The wall painting opposite, above the north door, is St Christopher. Although it isn't as clear as himself at, say, nearby Bradfield Combust, he bestrides the river in the customary manner, staff in hand. The Christ child is difficult to discern, but you can see the fish in the water. Also in the water, and rather unusual, are two figures. They are rendered rather crudely, almost like gingerbread men. Could they be the donors of the north aisle, John and Katherine Hoo in person? Moving along the north aisle, we come to the set of paintings for which Hessett is justifiably famous. They are set one above the other between two windows, at the point where might expect the now-vanished screen to a chapel to have been. The upper section was here first. It shows the seven deadly sins (described wrongly in some text books as a tree of Jesse, or ancestory of Christ). Two devils look on as, from the mouth of hell, a great tree sprouts, ending in seven images. Pride is at the top, and in pairs beneath are Gluttony and Anger, Vanity and Envy, Avarice and Lust. Mortlock suggests that some attempt has been made to erase the image for Lust, which may simply be mid-16th century Calvinistic prurience on the part of some reformer here. This would suggest that this cathecetical tool was here right up until the Reformation. The idea of 'Seven Deadly Sins' was ananthema to the reformers, because it is entirely unscriptural. Rather, as a catechetic tool, it is a way of drawing together a multitude of sins into a simplistic aide memoire. This could then be used in confession, taking each of them one at a time and examining ones conscience accordingly. It should not be seen simply as a 'warning' to ignorant peasants; the evidence is that the ordinary rural people of late medieval England were theologically very articulate. Rather, it was a tool for use, in contemplation and preparation for the sacrament of reconciliation, which may well have ordinarily taken place in the chapel here. The wall painting beneath the Sins is even more interesting. This is a very rare 'Christ of the Trades', and dates from the early 15th century, about a hundred years after the painting above. It is rather faded, and takes a while to discern, and not all of it is decodable. However, enough is there to be fascinating. The image of the 'Christ of the Trades' is known throughout Christendom, and contemporary versions with this can be found in other parts of Europe. It shows the risen Christ in the centre, and around him a vast array of the tools and symbols of various trades. It rises from the medieval perception that Christ was a working man, a carpenter, and it symbolises the dignity of labour and of craftsmanship. I think it is extremely unlikely that it shows symbols of things which shouldn't be done on a Sunday, although Anne Marshall's Painted Churches site contains an interesting argument to the contrary. Perhaps the most fascinating symbol, and the one that everyone notices, is the playing card. It shows the six of diamonds. Does it represent the makers of playing cards? If so, it might suggest a Flemish influence. Or could it be intended to represent something else? Whatever, it is one of the earliest representations of a playing card in England. Why is this here? It may very well be that there was a trades gild chantry chapel at the east end of the north aisle, and this painting was at its entrance. At the east end of the north aisle now is the church's set of royal arms. Cautley saw it in the vestry in the 1930s, and identified it as a Queen Anne set. Now, with additions stripped away, it is revealed as a Charles II set from the 1660s, and a very fine one. It is fascinating to see it at such close range. Usually, they are set above the south door now, although they would originally have been placed above the chancel arch, in full view of the congregation, a gentle reminder of who was in charge. The glass alone is worth coming to Hessett to see. Few Suffolk churches have such an expanse, none have such a variety, or glass of such quality and interest. It consists essentially of three ranges: the life and Passion of Christ in the north aisle (although some glass has been reset across the church), images and hagiographies of Saints in the south aisle, and a heavily restored but nonetheless fascinating sequence of the life of Christ in the west window. This bears close attention, for the fragments set into the restored work include several fascinating details, including the punctured feet of Christ ascending to heaven in a cloud of glory, and a Harrowing of Hell including the crushing of a fallen angel. In the north aisle, the scourging of Christ stands out, the wicked grins of the persecutors contrasting with the pained nobility of the Christ figure. In the next window, Christ rises from the dead, coming out of his tomb like the corpses in the doom paintings at Stanningfield, North Cove and Wenhaston. The Roman centurion sleeps soundly in the foreground. The most famous image is in the east window of the south aisle. Apparently, it shows a bishop holding the chain to a bag, with four children playing at his feet. I say apparently, because there is rather more going on here than meets the eye. The reason that this image is so famous is that the small child in the foreground is holding what appears to be a golf club or hockey stick, and this would be the earliest representation of such an object in all Europe. A rather more sober school of thought argues that it is a fuller's club, used for dying clothes, and the symbol of St James the Less. The whole image has been said to represent St Nicholas, who was a Bishop, and whose legends include a bag of gold and a group of children. Unfortunately, this is not convincing. St Nicholas is never symbolised by a bag of gold, and there are three children in the St Nicholas legend, not four. In any case, the hand in the picture is not holding the chain to a bag at all, but a rosary. What has happened here is that the head of a Bishop has been grafted on to the body of a figure which is probably still in its original location. The three lights of this window contained a set of the Holy Kinship. The light to the north of the 'Bishop' contains two children playing with what ae apparently toys, but when you look closely you can see that one is holding a golden shell, and the other a poisoned chalice. They are the infant St James and St John, and the lost figure above them was their mother, Mary Salome. This means that the figure with the Bishop's head is actually Mary Cleophas, mother of four children including St James the Less, and it really is a fuller's club. The third light to the south, of course, would have depicted the Blessed Virgin and child, but she is lost to us. If the windows and wallpaintings were all there was, then Hessett would be remarkable enough. But there is something else, two things, actually, that elevate it above all other Suffolk churches, and all the churches of England. For St Ethelbert is the proud owner of two unique survivals. At the back of the church is a chest, no different from those you'll find in many a parish church. In common with those, it has three separate locks, the idea being that the Rector and two Churchwardens would have a key each, and it would be necessary for all three of them to be present for the chest to be opened. It was used for storing parish records and valuables. At some point, one of the keys was lost. There is a great story about the iconoclast William Dowsing turning up here and demanding the chest be opened; on account of the missing key, it couldn't be. Unfortunately, this story isn't true: Dowsing never visited Hessett. The chest was eventually opened in the 19th century. Inside were found two extraordinary pre-Reformation survivals. These are a pyx cloth and a burse. 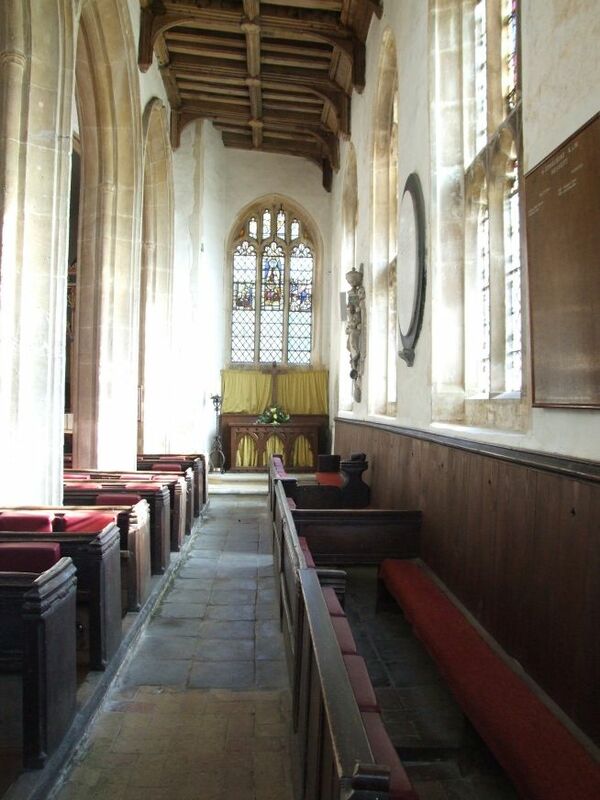 The pyx cloth was draped over the wooden canopy that enclosed the blessed sacrament (one of England's four surviving medieval pyxes is also in Suffolk, at Dennington) before it was raised above the high altar. The burse was used to contain the host before consecration at the Mass. They are England's only surviving examples, and they're both here. Or, more precisely they aren't - both have been purloined by the British Museum, the kind of theft that no locked church can prevent. But there are lifesize photos of both either side of the tower arch. The burse is basically an envelope, and features the Veronica face of Christ on one side with the four evangelsitic symbols in each corner. On the other is an Agnus Dei, the Lamb of God. The survival of both is extraordinary. It is one thing to explore the furnishings of lost Catholic England, quite another to come face to face with articles that were actually used in the liturgy. In front of the pictures stands the font, a relatively good one of the early 15th century, though rather less exciting than everything going on around it. The dedicatory inscription survives, to a pair of Hoos of an earlier generation than the ones on the vestry.Turning east again, the ranks of simple 15th century benches are all of a piece with their church. They have survived the violent transtions of the centuries, and have seated generation after generation of Hessett people. They were new here when this church was alive with coloured light, with the hundreds of candles flickering on the rood beam, the processions, the festivals, and the people's lives totally integrated with the liturgy of the seasons. For the people of Catholic England, their religion was as much a part of them as the air they breathed. They little knew how soon it would all come to an end. 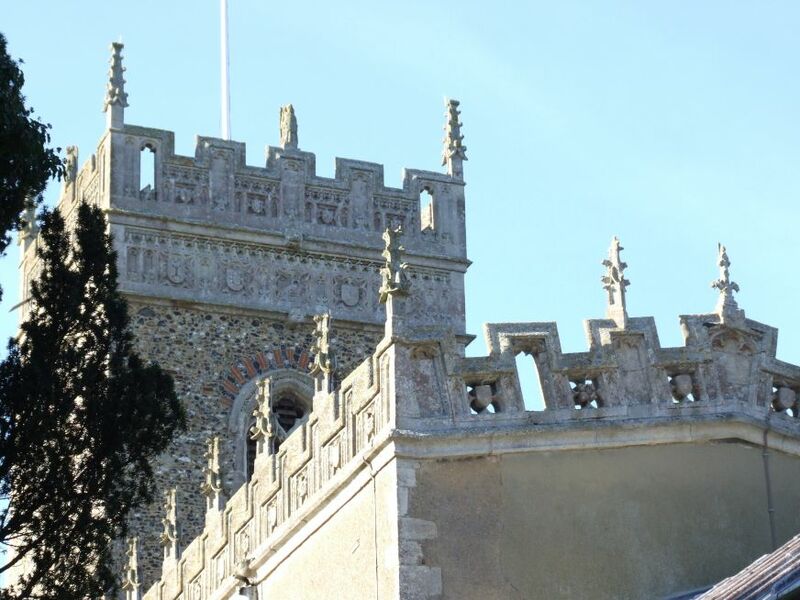 And so, there it is - one of the most fascinating and satisfactory of all East Anglia's churches. And yet, not many people know about it; we are only three miles from the brown-signed honeypot of Woolpit, where a constant stream of visitors come and go. I've visited Hessett many times, and never once encountered another visitor. Still, there you are, I suppose. Perhaps some places are better kept secret. But come here if you can, for here is a medieval worship space with much surviving evidence of what it was actually meant to be, and meant to do. And even more than that, it is one of the loveliest churches I know.